A large part of Russian society thinks the terrorist attack on the Charlie Hebdo magazine was prompted by the journalists themselves. Many said they didn’t approve of the attackers’ actions, but understood them. According to the latest research released by the VTSIOM public opinion center, 74 percent of Russians know about the shooting in the Paris headquarters of the Charlie Hebdo magazine on January 7. The largest group of responders – 30 percent – said in their view the tragedy must be blamed on the “behavior of the French journalists who insulted Muslim religious values.”Twenty-five percent answered that the blame lies with the French government for allowing such insults in the first place. Another 11 percent said the French Government was responsible for the events because it had allowed too many Muslims into the country. Only 8 percent of Russians think the problem lies in the behavior of the extremists, who answered the cartoons with extreme violence. Another five percent maintained the attack had been launched because all Muslim extremists despise freedom of speech and the secular state. Six percent of responders think the main blame should be leveled at French special services, who failed to counter the militant Islamist group prior to the attack. Five percent confessed they “understood and approved of” the terrorists’ actions. Thirty-nine percent said they understood the attackers’ motives, but could not approve of the murder. The majority of Russians – 48 percent - neither understand the killers’ motives, nor support them. The head of the VTSIOM agency, Valery Fyodorov, told the popular business daily Kommersant that the results of the poll demonstrated most people in Russia understood that Muslim radicals were dangerous and preferred to treat them with extreme caution. “The danger of Islamic extremism is obvious for everyone, but people consider it wrong to ‘tease the geese.’ Islam is one of the traditional religions in Russia, Muslims have lived here for a thousand of years and our citizens hold it absolutely inadmissible to insult this culture,” Fyodorov told reporters. The religious cartoons, even when they are presented as modern art, are negatively perceived by most Russians, the researcher noted. He said that the poll contained yet another question – whether Russians thought events similar to Charlie Hebdo massacre would be possible in their country. While 50 percent estimated such developments as improbable, 35 answered that the danger was real. “This means that fears exist and there is a demand for safe behavior. This is why the cartoonists’ actions are still seen as risky,” Fyodorov said. 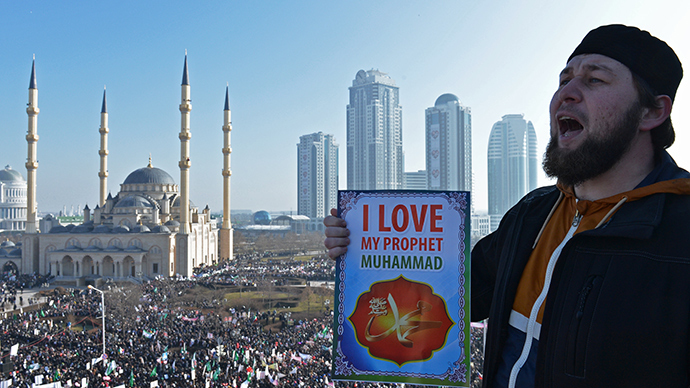 The VTSIOM poll was held on January 17-18, a week and a half after the Charlie Hebdo attack and less than a week after a massive rally against insulting the prophet was held in the Chechen capital of Grozny. The rally was personally led by the head of the republic, Ramzan Kadyrov. According to local police, more than 1 million people took part in the protest.